Bloodshed or bailout – is Mubarak too big to fail? – Egyptian Vice President Omar Suleiman, to reporters, Wednesday. Blustery threats from Egypt’s recently appointed vice president are barely blowing the sand from the pillar of protest against the embattled government’s leadership. The people in Egypt’s streets will not cease until their pillar becomes an obelisk, a monument to the defeat of a rich and powerful enemy – Mubarak, his corrupt party, his brutal police force. Meanwhile, we in the US have written a scenario where we appear to be comfortable with the status quo of a drawn out transition. We have voiced our opinion in the matter, and are done. Fifty-eight percent of us told a Reuters/Ipsos poll that we prefer the “cautious approach,” and let the Egyptian government take it slow. Ipsos pollster Julia Clark says those results suggest “a pretty nuanced view of the situation in Egypt and the possible consequences” to American national security. Eh, maybe. It is also possible that our attention span for the news from Egypt is maxed out, severed by the national obsession with the big game this past weekend. We are satisfied enough with the Obama administration’s response, not particularly frightened by it, so we can let go of it. Time to eat a spoonful of corn flakes, change the channel to Real Houswives of Des Moines, and move on. But our foreign policy on this story is a divided one. How can we be giving Mubarak’s regime assurances they are doing the right thing in planning a “smooth” transition, while at the same time saying, “it is for the Egyptians to decide?” The Egyptians have decided – they want Mubarak out. The answer is simple. We consider Hosni Mubarak too big to fail. If Tunisia was the small, regional bank, Egypt is Chase. Both in proximity and weight, were Egypt to fall to unfriendlies, it would be a major domino that could compromise our interests in the Middle East, Central Asia and in the so-called War on Terror (ick, I know, right? I hate that phrase too – it’s so Bushy). Suleiman threatens, “[If] a coup happens, [it] would mean uncalculated and hasty steps, including lots of irrationalities. We don’t want to reach that point,” but it will. With crowds growing again, and internet activist turned opposition firebrand Wael Ghonim telling them, “We will not abandon our demand – the departure of the regime,” the “point” Suleiman doesn’t want to reach seems inevitable. But that’s not inevitable – not with a tested remedy to “too big to fail” at hand. It’s time for a bailout. There may already be two suitcases, waiting to travel under diplomatic pouch. One has Hosni Mubarak’s name on it; the other has the name of the protester who is the most reasonable successor, or maybe an organization; both cases contain cash. A lot of cash. 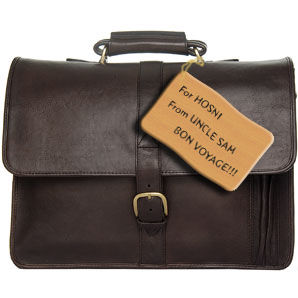 Thusly gifted, Hosni hastens to Paris, and a new regime, with a debt to America, moves Egypt forward.